A visit to Bhutan cannot really be complete without a foray into the culturally rich and picturesque HAA Valley. This valley adjoins the districts of Samtse, Paro and Chukha and encompasses over 1706 sq. km. This is one of the least populated valleys of Bhutan and has a strong Tantric culture. Many seekers of occult and alternative magic visit the HAA Valley for its tantric symbolism and before the 8th century, animal sacrifices were common here. However, Padmasambhava, one of the major Buddhist religious icons was responsible for subduing the more violent practices of the HAA Valley though evidence of this belief system is sometimes demonstrated through current rituals and customs. Nature lovers will find HAA Valley to be a paradise of beauty as its diversity in flora and fauna is unparalleled. Tourists interested in cultural activities will find the shamanistic practices demonstrated by HAA dwellers fascinating while for photographers there can be no better destination. Haa is known for being the traditional home for the Royal Queen Grandmother and the famous Dorji family. Nomadic herdsmen and tribal in Haa organise a famous Haa summer festival that provides a nice opportunity for exploring village life. The ride to HAA Valley involves crossing the stunning Chele La Pass which offers great views of Mount Chomolhari and Jichu Drakey. Bhutan’s choicest biking trails, village trails and walking tours are organised around this region. But there is little capacity for shopping and fine dining. However, Haa valley is home to one of Bhutan’s finest weaver communities so collecting textiles can be on your agenda here. Haa was opened to tourists since 2002 and there are not many options of conveyance. Haa has a strategically critical position as its very near the Indo-Tibet border and the IMTRAT (Indian Military Training Teams) has a critical presence in the Haa town. You can directly catch a cab from Phuntsheoling to HAA Valley and the fare is 3791 NU for a distance of 223 km. If you are arriving at Paro Airport, you could book a taxi directly to Haa valley or plan a day trip to the valley during your Paro stay. It will take you only 2 hours to cover the distance of 65 km. From Paro to Haa valley the cab fare is 1060 NU. 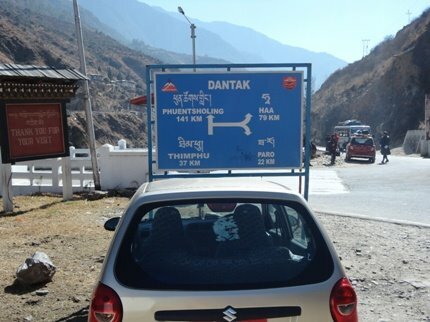 From Thimphu to Haa it is 114 km and it will take you 3 to 4 hours to reach. A full taxi will charge around 1938 NU from Paro and 3200 NU from Thimphu and the shared taxi will charge between 500 to 600 NU per seat (you must wait till taxi driver gets enough passengers). From Thimphu bus stand a local bus leaves for Haa every day at 1 p.m. and the fare is just 240 NU and from Paro bus stand, a bus leaves on Monday, Wednesday and Friday at 9 a.m. for Haa valley. Fare is around 200 NU. However, both bus journeys are quite long and hiring a car is a much better option. There are two route choices you get while travelling from Thimphu, Phuentsheoling to Haa; through the Chele La Pass (check section on Chele La) and through the Chuzom. 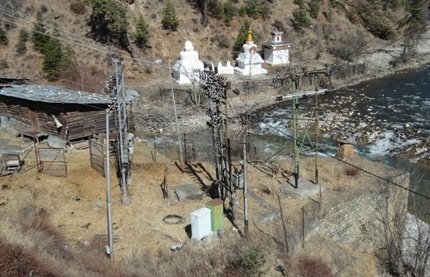 There are several interesting yet rarely visited sights en route Thimphu to Haa via Chuzom. It takes 45 minutes (24 km) to reach Chuzom from Paro and one hour (31 km) to reach Chuzom from Thimphu. There is the Dobji Dzong (once upon a time it was a prison and now it’s a school) and there is the impressive looking Phundup Pedma Yoeling Shedra. Look out for the beautiful village of Susana just before Mendegang and the Gyeshina Village (this contains the decadent Gurugang Gompa). Just 30 km before Haa, you will see Bietakha (a ruined ancient dzong) and 5 km ahead there is Nago (look out for water strung prayer wheels). Chuzom is a major junction road with one road leading to Haa (south west 79 km), one road to Phuntsheoling (south 141 km) and one to Thimphu (North east 31 km). On the way, many farmers sit and sell dried cheese, vegetables and apples. Incidentally Chuzom is also the confluence of two rivers, Paro Chu and Thimphu Chu which merge to become Wangchu. There are three chortens in this area, Nepali, Tibetan and Bhutanese…designed to keep evil away. Travelers visiting Haa post 2018 will get the option of taking a shorter road via Wanakha/ Chukha after driving in from Phuntsheoling/ Thimphu. The twin temples i.e. Lhakhang Karpo and Lhakhang Ngapo stand at the base of the stunning Meri Phuensum mountains or the three brothers mountains who are symbolic of the 3 protectors of the valley; Vajrapani, Manjushri and Avaloketeshwara. Near the temples there is a sacred Chorten which contains a highly-revered imprint of Guru Padmasambhava’s hat and body. The Lhakang Karbo is popularly known as the white temple and it is a popular seat for embodying the true Buddhist values of kindness and Dharma. Life at Lhakhang Karpo is believed to be a gentle passage to the liberating realm of death. This temple was built in 7th century during the reign of Emperor Songstan Gampo. The temple is a big one and is home to Haa’s monastic order. In 2011 the white temple underwent reconstruction activities and the monk’s quarters were completely revamped. The temple has snowy whitewashed walls and the whole structure embodies a restraint that speaks of supressing the senses and leading a life of soul awareness. Every year, a seven-day puja called Moenlam Chenmo is practiced in the temple where blessings are sought from Je Khenpo while prayers are uttered for the welfare of all humans. Myths say that divine rays were emitted from the body of Chogyal Songstan Gampo and the dark rays fell on the site of the black temple while the white rays fell on Lhakhang Karpo (white temple). Some other legends say that a white pigeon flew to the temple site from Tibet marking the spot for the temple. Still other stories say that the black and white temples were built by 3 Brother Hills dwellers (Miri Punsum). It was built roughly during the same time as White temple. The dark and mysterious black temple represents the tantric procedures that are so rampant in the valley. Locals believe that the black temple stands on top of an invisible lake. The building is starkly painted in black with deep horizontal gashes of white and red. There are no monk’s quarters here and only a caretaker’s hut with a fierce looking dog exist. Don’t forget to visit the holy oak tree near the black temple. This small but historically significant dzong is said to have been built on the right side of Cherenzi mountain range. There are interesting Thangkas and wall paintings inside that you might explore. There is an old bridge connecting the Haa Valley to the Samarpudung valley and it is called the Has Samarpudung. This bridge denotes ancient Bhutanese engineering principles and is supposed to possess magical powers. Below the bridge is a lake which is known as the lake of the Wishing cow. Locals say that the stone udders of the cow can still be seen under the clear waters of the lake. It is a common practice to stand on the bridge and make a wish on the wishing cow lake. Travel south from Haa (5 km) to reach the river and then cross the river to reach the village of Yangthong. The road to the village reaches the side valley containing Chhundu Pang ceremonial ground (until the recent past, annual Yak sacrifices were made to satiate App Chhundu). After you cross the ceremonial ground, you reach the Makha Zampa. The monastery of Yangthong stands on a ridge and has beautiful murals of the paradise of Rinpoche along with some rather attractive mermaid deities. Incidentally, the priest there believes that the mermaids live in the pool outside the monastery. If you wish you can trek further up (2 km) to reach the Tsenkha Gompa/ Changkha and then 3 km up to Jangtey Goemba. This Lhakhang has strong tantric connections and is dedicated for the appeasement of Apu Chunndu/ Chungdue who is the dominating guardian of the Haa Valley. Chungdue is a vicious deity who is believed to have caused earthquakes, landslides, cyclones, meteor storms, rocks which split apart and other disasters. It was only after Padmasambhava’s arrival in 8th century that the deity resigned some of his more violent powers. Inside the Lhakhang, the statues of blue skinned App Chhundu and the red skinned Jowya glare out from inside glass cabinets. It is advised not to stare for too long at them because of strong tantric repercussions. Incidentally, the temple is an ode to Bhutan’s pre-Buddhism past… which is one of animistic practices. You need to cross one of the few notable restaurants in Haa, Doley Penson’s restaurant (1 km north of Haa) before you reach the Katsho village. From the village, you can hike up for 40 minutes to Juneydrak hermitage. On the way to the hermitage, you will see mani (prayer wheel wall) and then a khonying (two pillared archway) which leads to a bridge. Once you cross the bridge you will find yourself in a beautiful rhododendron forest. There is a red sign which indicates the left direction to the hermitage. The entry to the hermitage/ Lhakhang is rather difficult as there are wooden ladders with ropes that must be handled. The caretaker will help you though!! The most notable feature of the hermitage is the footprint of Machig Labdrom who was Bhutan’s earliest and fiercest female Tantric practitioner. She practiced the Chod ritual in which self-dismemberment was performed to destroy the ego. This is a small Goempa worth visiting more for the lovely walking trail that leads to it than its contents. However, the temple does have some nice specimens of Thangkas. In case you are an avid photographer or a nature lover then don’t miss out on spotting/ capturing the famous Himalayan Blue Poppy (Meconopsis grandis) that is incidentally the national flower of Bhutan. Haa is incidentally one of the best places to explore for the Blue Poppy. Many strains of the blue poppy bloom along the passes surrounding Haa and Chele La Pass. 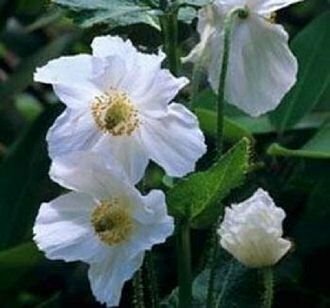 One of the largest strains; M Superba that is a cream colored bloom is only found in Haa.